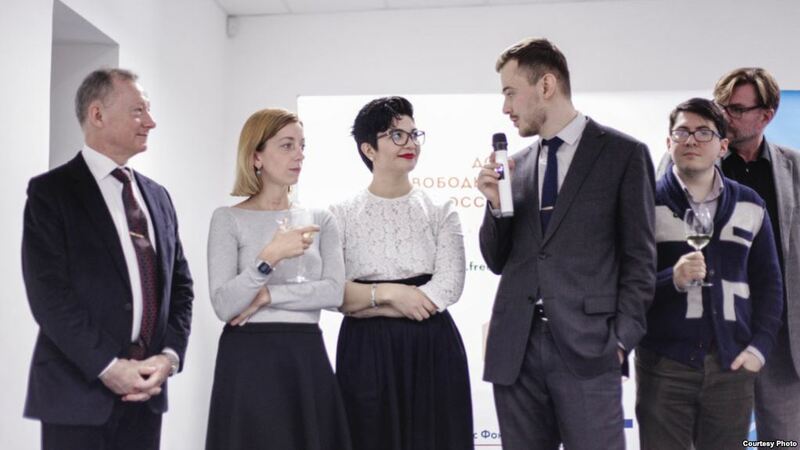 KIEV, Ukraine -- Organizers from the Free Russia Foundation, a U.S.-based NGO founded by Russian dissidents, have opened what they call “an Embassy of the Civil Society of Russia in Ukraine,” in Kiev's trendy Podil district. Free Russia House activists are seen at their new offices in an undated photo in Kiev, Ukraine. The activists say the offices are to serve as a cultural center and think tank, as well as provide support for Russians who fled to Ukraine for political reasons. Housed in a red brick building with a small blue sign that reads “Free Russia House,” its founders plan to transform the now-bare office into a cultural center and think tank, as well as a support service for Russians who fled to Ukraine for political reasons. Vladislav Davidzon, chief editor of Odessa Review, an English-language monthly, is a member of the center’s advisory board and was present at its opening. According to him, the main goal of the center is to increase trust between anti-Kremlin Russians and Ukrainians. “The issue is that Ukrainians and Russians have no actual contact,” Davidzon said. But apart from providing a basis for dialogue between Russians and Ukrainians, the center has a more practical purpose. Since Russia annexed Crimea in 2014 and began backing armed separatists in the Donbass region of eastern Ukraine, several thousand Russian citizens have fled to Ukraine. A number of them volunteered to fight in the ranks of the Ukrainian armed forces. However, many of them face difficulties acquiring residency in Ukraine and potential prosecution if they are forced to return to Russia. The center sees as one of its main goals helping these Russians acquire residency - or, in the case of those who served in the armed forces, citizenship. “We work with this issue,” said Greg Frolov, the center’s director. Although the Free Russia House bills itself as an opposition-aligned organization, it hasn’t been warmly embraced by many Ukrainians, who find it difficult to trust such initiatives. Many Ukrainian public figures and activists note that most Russian opposition politicians have failed to stand up for Ukrainian territorial integrity, particularly on the issue of Crimea. Frolov, however, said his center is not directly connected to any of those politicians, and their official position is that the Crimean peninsula is part of Ukraine. Still, the center’s opening was met with much hostility on social media. “I was attacked by more than 1,700 troll comments on social networks, many of these quite vicious, understandably so after three years of war waged on Ukraine by the Kremlin,” Davidzon said. He draws a distinction between those comment writers and more serious critics, who say that Russian opposition activists ought to be organizing in Russia. Although the center has been vetted by Ukraine’s security service and has the support of some Ukrainian public figures, it still faces distrust from Ukrainians who have grown accustomed to the Kremlin’s frequent use of shadowy NGOs and organizations to achieve its ends in Ukraine. Frolov says his organization understands the problems Ukrainians have with Russian opposition figures’ ideas about their country. Still, he sees a need for cooperation.